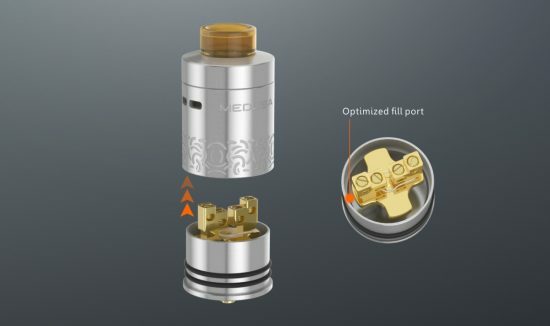 The GeekVape Medusa Reborn, or Medusa v2, is being marketed as an RDTA, but some people, myself included, regarded more as an RDA with a really deep juice well that can hold up to 3.5 ml of e-liquid. The original Medusa had its share of fans, but it did have some design flaws that put off a lot of vapers that would have otherwise considered buying it, so GeekVape decided to put out an improved version that addresses most of the problems of their original atomizer. Is the Medusa Reborn worth your hard earned money? Check out my review and find out. The Medusa Rebord RDTA comes in a silver plastic case with a transparent lid that offers a clear view of the actual device, but since mine was a sample from the manufacturer, it came in a small cardboard box labeled “Free Sample”. But hey, it’s what’s on the inside that matters, right? 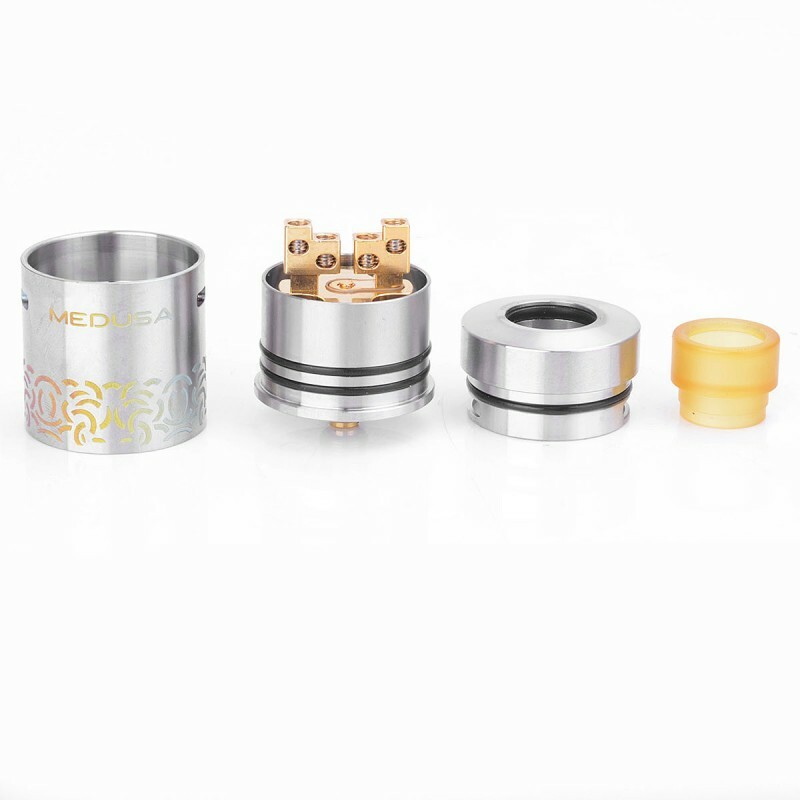 In the box, we have the 24-mm diameter Medusa Reborn atomizer, a small user manual and a bag of accessories and spare parts (a mini screwdriver, a 510 drip tip adapter, a hollow connection pin for squonker-type devices, several o-rings and four spare screws for the build deck). 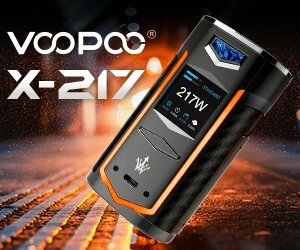 All in all, it’s a nice package, and I’m particularly happy that they finally decided to add a user manual, as that has been one of my main gripes with GeekVape for a long time. The Medusa Reborn isn’t your typical RDTA. 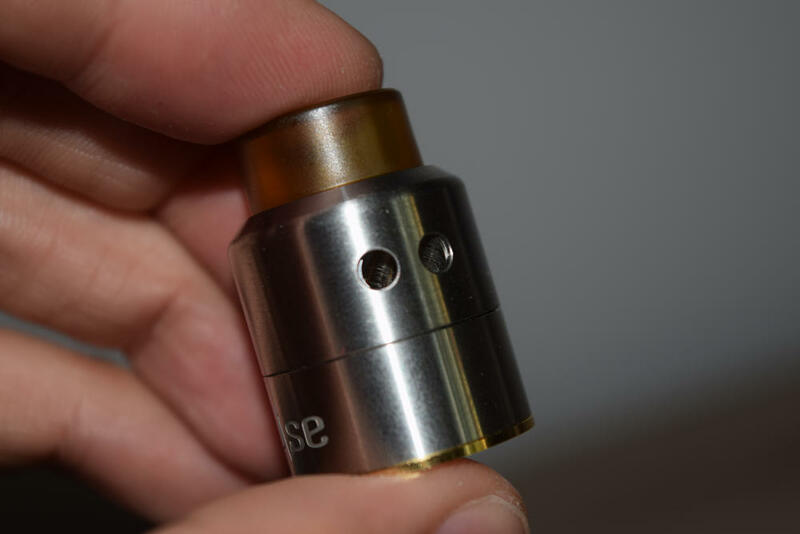 For starters, it doesn’t even look like one, but rather as an elongated RDA, as their is no glass section under the build deck, and the metal barrel extends all the way to the base of the atomizer, just like on a regular RDA. I, for one, have never used RDTA like this before, but I was definitely intrigued by the design. 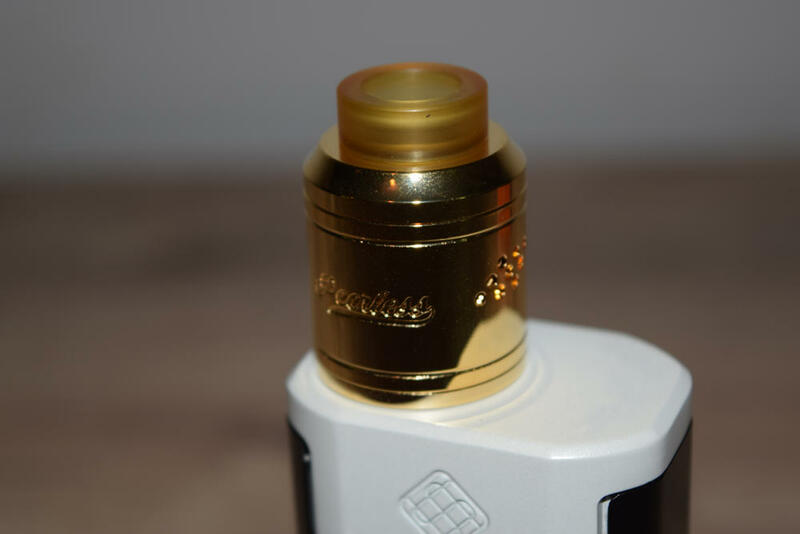 Starting from the top, the GeekVape Medusa RDTA has a wide Goon-style Ultem drip tip that might look great, but is actually way to short for my liking. 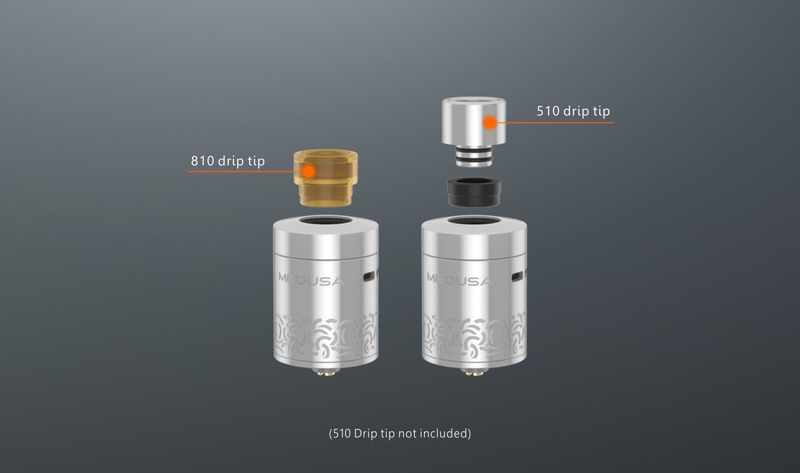 I don’t how these stubby drip tips became so popular, because there’s hardly anything to grab onto with your lips, not to mention that you almost always touch the metal top cap of the atomizer, as well. Now, that may not sound like a big deal, but wait until you fire up this baby at high wattage and you’ll start to feel what I’m talking about. Stainless steel is a great heat conductor, so the Medusa can get very hot, and when your lips touch it, well, you get the point. Luckily, the kit does include a 510 drip tip adapter, and it’s actually one of the nicest I’ve seen. That’s because it extends into the top cap completely, so any drip tip sits flush on the atomizer. And, if you prefer the wide bore tips, any Goon-style drip tips will fit without the adapter. Further down, we have the top cap, which also acts as an airflow control ring, allowing you to regulate the air coming through the four cyclops slots on the barrel of the atomizer. 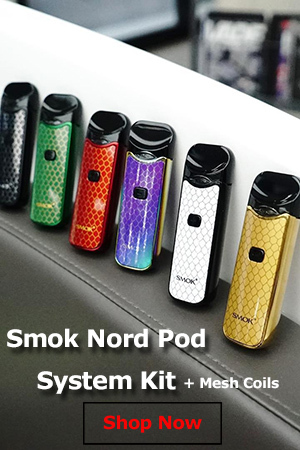 The barrel has two airflow slots on each side, and there’s no way to block any one side while keeping the other open, so single coil vaping is not an option, only dual coil mode. On the lower half of the barrel, we have what looks like a tribal design etched into the steel, but a closer look reveals that it is actually a motif made up of Medusa’s eyes and snake-like hair. It’s pretty neat, if you can appreciate clever art. On the inside, the barrel has a “lip”, the purpose of which I have not yet figured out, but one thing I can tell you is that you have to consider it when inserting your coils, as leaving them extended too far from the posts will make it impossible to slide the barrel over the bottom well. That’s precisely because of this inner lip that essentially narrows the space you have available inside the atomizer. The base of the Medusa Reborn is made up of a cross-shaped build deck, with a two post design and featuring four massive wire holes positioned asymmetrically to make inserting the coils easier. The leads of your cotton wicking extend into the deep juice well below through the spaces between the four sides of the cross-shaped deck, which theoretically lets you use this device as an RDTA. The well holds up to 3.5 ml of e-liquid, which is plenty, in my opinion, but the problem is that because this is a metal well, and not a glass tank, you never know exactly how much juice is in there. You can take off the top cap and tilt the atomizer from time to time, to see if there’s any juice flowing from the well, but other than that, you just have to make sure that you top it off regularly, to keep the cotton nice and moist. I haven’t had the chance to use the hollowed out connection pin, as I don’t own a squonqer, but if you’re into that sort of device, this included accessory is certainly a plus. 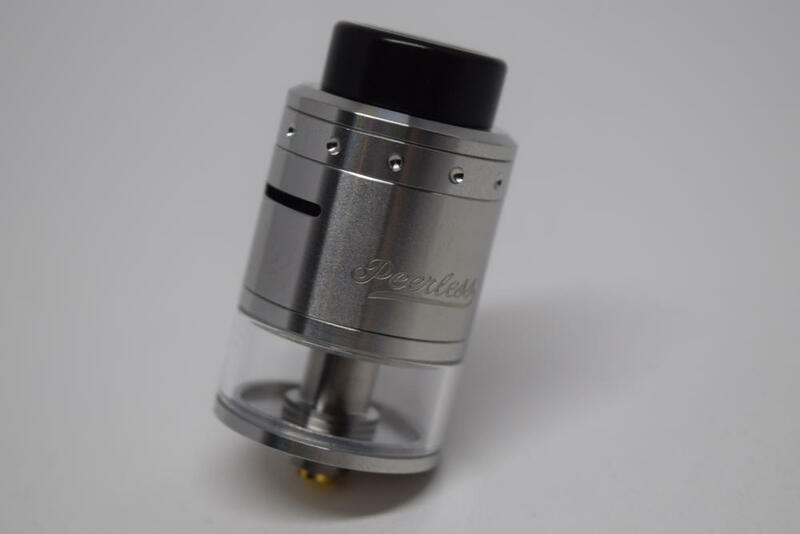 Overall, I would say that the build quality of the GeekVape Medusa is top notch, from the materials to the flawless machining, but there are still some design elements that just don’t make sense, in my opinion. Getting the GeekVape Medusa Reborn ready for your first vape is a fairly simple process, especially if you have some experience with RDAs or RDTAs. The first thing you need to do is rinse all the parts, to get rid of any leftover machining oil. Once you’re done, wipe the water with a paper napkin and you’re ready to go. Mounting the coils on the build deck of the Medusa Reborn is very easy, thanks to the asymmetrical positioning of the holes (two lower and two higher) which align perfectly with the leads of your coils. There are actually two ways to insert the coils. The first one, which is recommended by the manufacturer, according to the photos I’ve seen going around online, requires you to insert one opf the leads in one of the higher holes, and the other in one of the lower holes. Once the leads are in place, fasten the screws and then push the coils so that they align with the air holes on the barrel. The other way to insert the coils is easier. To bypass having to align the coils with the airflow slots, you can simply insert both leads into the lower holes of the build posts, which are located in the center of the build deck. Luckily, the holes are big enough to accommodate some of the largest wires available right now, so space is definitely not a problem. Whichever way you decide to install the coils, you still need to wick them properly to get the most out of the Medusa Reborn. In that respect, the cross-shaped deck is a big advantage, as you have plenty of space to extend even the fluffiest of cotton leads into the juice well. I for one never overdo is with the cotton. I prefer to keep them short and thin, which I feel works better, but I’ve seen people stick loads of cotton through their coils and they seem pretty happy with the result, as well. Ultimately, wicking, like e-liquid, is a matter of personal preference. That being said, I would advise against stuffing the spaces between the build deck sides full of cotton, because when you pour the juice into the atomizer, the fluffy wick and the lip on the inside of the metal barrel will prevent it from going down into the juice well. Just make sure there is a little space left for it to flow through. Once you’re done, slide over the barrel and the top cap and you’re ready to vape. For all its little flaws and quirks, the GeekVape Medusa Reborn RDTA is one great atomizer! The amount o9f vapor it can generate depends a lot on the kind of build you have on and the power of your mod, but even a mediocre build like mine produces pretty impressive results. I currently have a couple of 26+30 AWG Clapton coils installed, with a combined resistance of 0.5Ω, and vaping at around 70W, the vapor clouds are thick enough to cut with a knife. I imagine you can get twice as much vapor with a lower resistance build and more power output, but even so, the vapor production is simply insane, and the vapor is just warm enough to be enjoyable. The flavor you get off this thing is incredible as well. 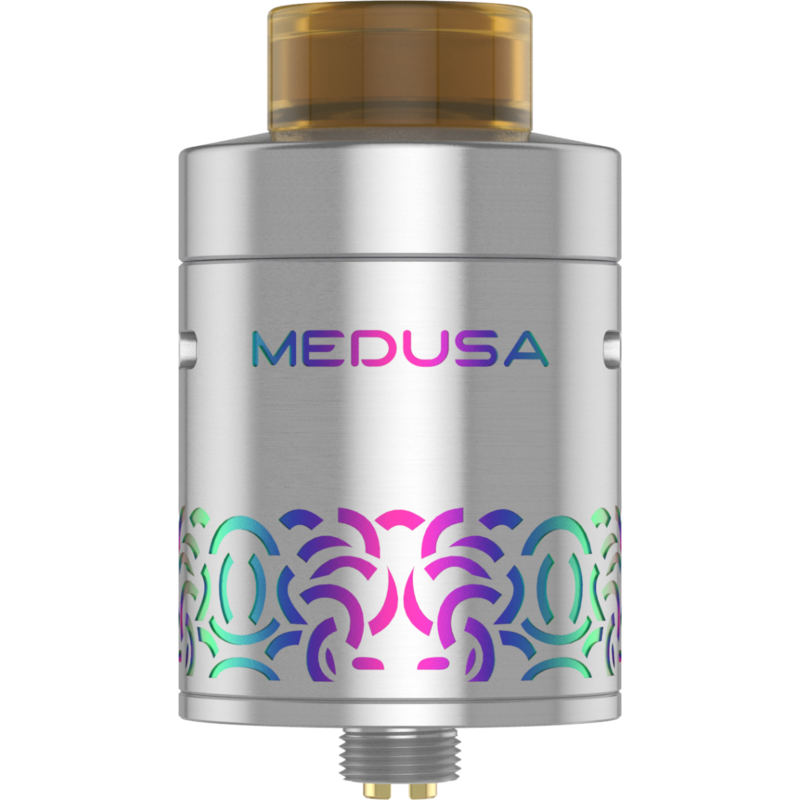 To be honest, I rank the Medusa Reborn right up there with the best RDAs I’ve tried, only it comes with the added bonus of a deep well that lets you vape for longer without having to worry about dry hits. Chain vaping can be a problem with some RDTAs, because the cotton needs time to soak up more juice between draws, but I noticed that if you keep the leads short and relatively thin, they soak the juice more effectively, and you don’t get any dry hits even when chain vaping. The only things you have to worry about when using the Medusa Reborn are the level of juice in the well, which is very hard to see, even if you remove the barrel completely, because of the cotton wick, and tilting the device for long periods of time, which can lead to e-liquid leaking from the well through the airflow slots. I never got a chance to use the original GeekVape Medusa, so I can’t really say how much this second generation improves on it, but I can tell you that, despite some minor design flaws, the Medusa Reborn is an actual RDTA/RDA (whatever you want to call it). It’s easy to build on, the deep well holds a fair amount of juice, and the vapor production and flavor intensity are born outstanding. My main complain about this atomizer is that you can’t see the level of the e-liquid still inside, but that weird lip on the inside of the tube and the stubby drip tip are also kind of annoying. Still, these cons are easily outweighed by the exceptional performance, so if you’re on the fence about giving the Medusa Reborn a try, I say go for it.